This prog also featured Dash Decent, The Mean Arena, Meltdown Man, Return To Armageddon and Strontium Dog and a Judge Dredd cover by Ron Smith. The Best Of Judge Dredd, The Best Of 2000AD 11, Judge Dredd Classics 68, The Complete Judge Dredd 17, Judge Dredd Chronicles Book 3, Judge Dredd 25, Judge Dredd Paperbacks vs Otto Sump, Judge Dredd The Complete Case Files 04. Mega-City One goes crazy for ugly. 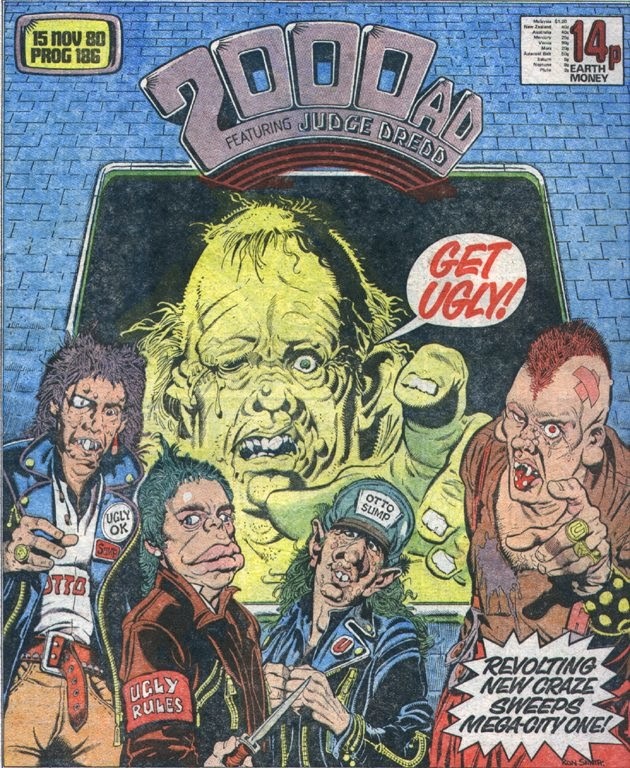 First appearance of Uglies, although not yet named as such. Otto Sump's Ugly Clinics have opened all over Mega-City One providing ugly treatments. There is on Paradise and 4th and another on 2088th Street. Shops are stocking Otto Sump products including: Bulging eyes, Scum roll-on-odorant the 18-hour pong, scab powder, blemish cream, Pimplex for pimples zits and acne, Sump paste for stale breath and tooth decay, Mixed Boils for painful and unsightly sores, Dandruff Shampoo medicated against medication, Wart-On wart inducer, Lip Chapper and Flabbon for use as of your uncontrolled diet. Puglies are gangs of youths using ugly products and causing trouble. He investigates a pair of bomb attacks of Otto Sump's Ugly Clinics. He earned over sixty million credits from his appearance on Sob Story. He invested the money in a chain of beauty clinics, but got a reputation for poor work and began getting requests from clients to make them uglier instead. Ugliness became fashionable and Sump turned his beauty clinics into ugly clinics. Sump sold a range of products designed to make you uglier, spent millions on advertising and bought Sump Tower. Two of his ugly clinics are targeted by a masked bomber. Mega-City One's acknowledged fashion queen. She received a beauty treatment from Otto Sump that left her with burns and broken teeth. Ugliness became fashionable. At least three. We see three corpses at the sight of the first bomb. Dredd (surrounded by corpses): "Somebody's discovered a new treatment, get ambulances down to the Sump clinic on Paradise and 4th!" Otto Sump previously appeared in 'Sob Story', Part 2. Another craze hits Mega-City One, but this one provides the opportunity for great visuals and Ron Smith's art shows some excellent before and afters, while the concept that ugliness could become fashionable if the right people take it up is brilliant. 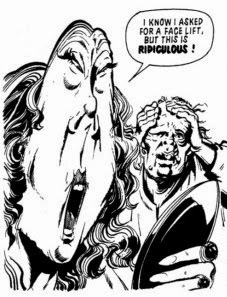 Dredd appears in the first panel to remind us it's his strip and is then absent until the end of this part. Mega-City One is arguably becoming a bigger presence than Dredd. Ro-Busters: Ro-Jaws' Memoirs, Part Three - Out!